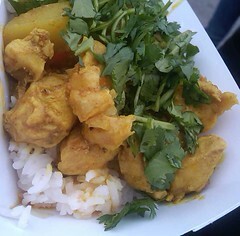 Seattle foodies get your appetites ready; the Mobile Food Rodeo is back again! This ultimate food truck experience, will gather more than 20 food trucks from all over the city — and a few from Portland. There’ll be something for everyone! Last year I judged with Table Talk Radio Host Jamie Peha and the Chef in the Hat Thierry Rautureau along with other fun, foodie luminaries. There were prizes for Best New Food Wagon, Best Side Dish, Best Dessert, and the most coveted award, the Wagon Wheel Award (Best in Show)! 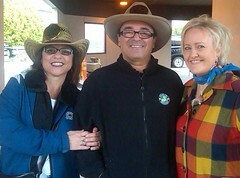 The Food “Sheriffs” ready to chow down! Let me tell you that it was fun but I was stuffed by the end of the day! After tasting different approaches to pizza to curries as well as hand-dipped ice cream cookie sandwiches to sliders, I rolled my way home! This year I will be out of town and missing out on the grub but keep me posted on your adventures – tweet me @KathyCaseyChef your favorites – so I can live/eat vicariously through you! 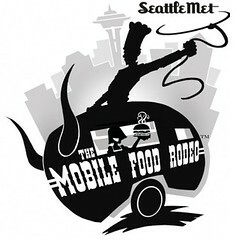 The Mobile Food Rodeo will take place on Sunday, May 6th from 11 – 6 just outside of Fremont Studios. The admission is free* so you can save your bucks for all the tasty treats. 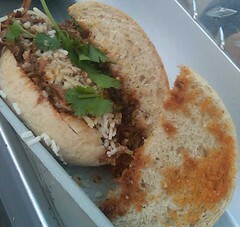 And to wash it all down there is a charity beer garden so you can hunker down and enjoy your chow! Among the trucks participating are Seattle institutions Where Ya at Matt (one of my all-time faves), Skillet, Maximus Minimus, Molly Moon, and Street Donuts. And that’s just to name a few! Even the Food Network’s Eat St. will be on hand to showcase Seattle’s vibrant street food culture and help crown the top food truck at the prestigious Wagon Awards. *Since this is a free event, expect long lines at each truck. To beat the lines, you may want to consider getting a VIF (Very Important Foodie!) Express Badge. Chloe Coscarelli to Visit Seattle! Make sure to mark your May calendars! Award-winning chef Chloe Coscarelli will be coming to the Pacific Northwest to promote her debut cookbook, Chloe’s Kitchen: 125 Easy, Delicious Recipes for Making the Food You Love the Vegan Way. After earning the top prize on Food Network’s 2010 Cupcake Wars with her all-vegan recipes, she’s been winning over new fans and turning heads with her scrumptious recipes. On May 23rd, she’ll be at Seattle’s Book Larder at 6:30pm and on May 24th, she’ll be at Mill Creek’s University Book Store starting at 7:00pm! The Children’s Trust Foundation is hosting A Place at the Table on Saturday, April 28th from 6:30 – 10:00pm in honor of Child Abuse Prevention Month. This special 5-course dinner event will take place at the Blue Ribbon Cooking & Culinary Center and features a fun line-up of cooking classes including Traditional French Sauces, a Chocolate Workshop & Truffle Making and Pasta Making as well as a slew of special guests! Make sure that you buy your tickets soon, as proceeds from this event will support the foundation’s mission. Cherry trees in bloom are always a sure-fire sign that spring is here. It’s also a great reminder that the Seattle Cherry Blossom and Japanese Culture Festival will be happening soon. Seattle has a rich connection to Japanese culture and you can join in on the celebration from April 13th-15th at the Center House Pavilion. 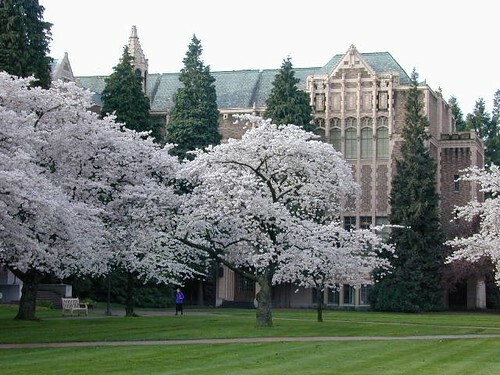 For a great view of cherry blossoms, I love to visit the University of Washington’s campus and walk around all their beautiful blooming trees. There will be lots to experience! Everything to help enjoy the culture and admire the beauty of spring: learn how to play the traditional game of GO (it’s like chess); watch and listen to the rhythmic playing of taiko drumming; participate in a tea ceremony demonstration and more. Oh, and don’t forget about the food! 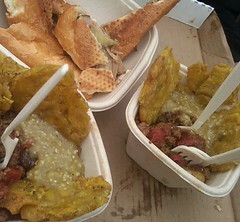 If you can’t make it, there are plenty of other ways to taste the culture. And there is no better way to way to fill-up than with a good roll of sushi and sake! A few of my favorite sushi spots to hit are Nishino in Madison Park – their plates are like works of art. Also, check out Shiro’s in Belltown…he’s the Godfather of creative sushi in Seattle. And in Ballard have a seat at Shiku – I love their Dragon Roll! This one is for all the cupcake enthusiasts! Back by popular demand, Cupcake Camp Seattle is holding it’s 3rd Annual event on Sunday, April 15th at the Canal from 11:30am – 2:00pm! Proceeds for this event will benefit the Hope Heart Institute. Make sure you get your tickets soon! Well who knew – but April is National Food Month here in the US! So let’s talk about our favorite things to cook at home. We all have our go-to and must-have recipes from the All-American mac & cheese and Filipino lumpia to handmade Mexican tamales. As a chef, I see LOTS of food in my everyday life from product testing to client recipe development to creative ideation sessions. Some might think it would be hard for me to pick a dish or two and deem it as my all-time-fave. Hands down, it’s no contest to what meal soars above the rest – and makes me feel all cozy inside! Just back from a trip to Ukraine and tired from the long, long trip, my husband John picked me me up from the airport and took us home. As soon as I opened the door, I smelled the deliciousness – could it be? Really? 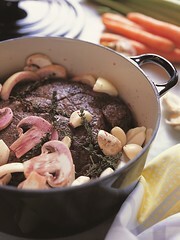 My favorite Slow-Cooked Pot Roast with Half a Bottle of Wine and 20 Cloves of Garlic?!?! What a welcome home! My favorite dish, so d’lish cozied up to fluffy mashed potatoes; now this is my comfort food! For those of you that know us well you also know this could have been some sort of miracle: John is not one who loves to cook. As a matter of fact, this is the first time in all these years that he cooked a full on dinner for me. And it was delicious! The recipe is from my favorite cookbook the now out of print Dishing with Kathy Casey. I said, “John, wow! This is perfectly cooked.” To which he replied, “Well this is the first time that I’ve ever made one of your recipes and they really are easy to follow.” Thanks John … for a wonderful and heartfelt welcome home!